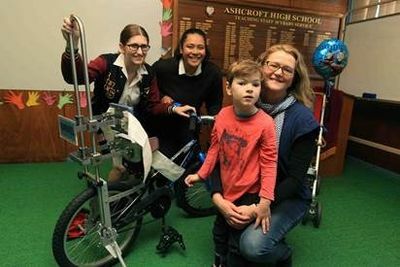 A smiling four year old Daniel O’Connor was the lucky recipient of a black and blue Freedom Wheels bike thanks to the students of Ashcroft High School. 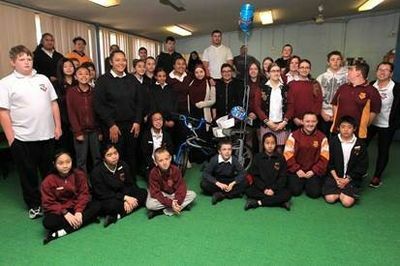 The student leadership council (SLC) held a school disco where proceeds from entry tickets were donated to TAD’s Freedom Wheels program. Daniel’s mum Jacqui had first applied for a Freedom Wheels bike for Daniel, who was diagnosed with Cerebral Palsy, when his pre-school introduced bike riding activities and other commercial products failed to fit his needs. Mum Jacqui said the bike would not only allow him so socialise with his peers, it could also give him enough strength to walk. “Riding the bike is going to be fun for Daniel, but it will also be very good therapy,” Jacqui said. The custom built bikes are subsidized by the generous individuals, companies and funding bodies. Thanks to the fundraising efforts of efforts from the students of Ashcroft High School, Daniel now has an opportunity to join in the fun like every other child. “Raising a child with a disability is very expensive and we tend to prioritise the absolute essentials," Jacqui said. "So to have something for Daniel like this is just fantastic”.